Dealing with all the aspects of diabetes in clinical practice, this book offers a comprehensive, easy-to-use guide to help healthcare professionals achieve their target of optimal management and treatment of their patients. Diabetes in Clinical Practice: Questions and Answers from Case Studies is presented in the form of questions concerning diabetes diagnosis, management and therapy based on real-life case studies. Each question is answered in a clear, easy to follow style. The authors begin with general questions regarding diabetes, its pathophysiology and diagnostic tests. They then cover all the major complications that can arise in a patient with poorly controlled diabetes. The authors also discuss special groups, such as adolescents and the elderly. The book features useful information for patients and their healthcare professionals on daily activities such as exercise, nutrition, driving, travelling and sick day rules. 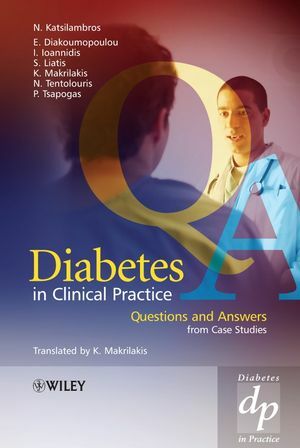 Diabetes in Clinical Practice: Questions and Answers from Case Studies is an indispensable resource for all members of the diabetes team, in primary and secondary care: physicians, diabetes specialist nurses, diabetes educators, dieticians, podiatrists, endocrinologists and postgraduate medical students. Nicholas Katsilambros, Evanthia Diakoumopoulou, Stavros Liatis, Konstantinos Makrilakis, Nicholas Tentolouris, Panagiotis Tsapogas, all at the Department of Propaedeutic Medicine of the Athens University, Medical School, The Diabetes Center, 'Laiko' General Hospital, Athens, Greece, and Ionnis Ioannidis, 2nd Department of Internal Medicine, Diabetes Clinic, Agia Olga General Hospital, Athens, Greece. Chapter 1: Overview of diabetes (Nicholas Tentolouris). Chapter 2: Pathophysiology of Type 1 diabetes (Ioannis Ioannidis). Chapter 3: Pathophysiology of Type 2 diabetes (Konstantinos Makrilakis). Chapter 4: Glycaemic control (Stavros Liatis). Chapter 5: Hypoglycaemia (Ioannis Ioannidis). Chapter 6: Diabetic coma (Ioannis Ioannidis). Chapter 7: Surgery in diabetes (Ioannis Ioannidis). Chapter 8: Acute illness in diabetes (Stavros Liatis). Chapter 9: Diabetes and exercise (Konstantinos Makrilakis). Chapter 10: Diabetes and pregnancy (Panagiotis Tsapogas). Chapter 11: Diabetes and the young (Ioannis Ioannidis). Chapter 12: Diabetes and old age (Konstantinos Makrilakis). Chapter 13: Diabetic retinopathy (Evanthia Diakoumopoulou). Chapter 14: Diabetic nephropathy (Evanthia Diakoumopoulou). Chapter 15: Diabetic neuropathy (Nicholas Tentolouris). Chapter 16: Macroangiopathy in diabetes (Ioannis Ioannidis). Chapter 17: Diabetic foot (Nicholas Tentolouris). Chapter 18: Skin disorders in diabetes (Konstantinos Makrilakis). Chapter 19: Sexual function and diabetes (Ioannis Ioannidis). Chapter 20: Musculoskeletal system and diabetes (Ioannis Ioannidis). Chapter 21: Infections in diabetes (Stavros Liatis). Chapter 22: Hypertension and diabetes (Konstantinos Makrilakis). Chapter 23: Lipids and diabetes (Konstantinos Makrilakis). Chapter 24: Diabetes and driving (Panagiotis Tsapogas). Chapter 25: Diabetes and travelling (Stavros Liatis). Chapter 26: Nutrition and diabetes (Konstantinos Makrilakis and Ioannis Ioannidis). Chapter 27: Treatment of diabetes with pills (Panagiotis Tsapogas). Chapter 28: Treatment of diabetes with insulin (Stavros Liatis). Chapter 29: New therapies in diabetes (Panagiotis Tsapogas). Chapter 30: Prevention of diabetes (Konstantinos Makrilakis).